When using a stick bait in the spring, I have found that on most days smallmouth prefer a horizontal presentation. A wacky worm is a vertical drop presentation so it is less effective in the cold water associated with the pre-spawn. Texas rigging a four inch stick bait with a 3/0 or 4/0 wide gap worm hook will give it a more horizontal presentation. You can either drag the jerkbait along the bottom or let it fall vertically, but by twitching the stick bait you will keep the bait horizontally in the water column. My most productive technique after I have located smallmouth is to cast out the stick bait and let it drop about half way in the water column. Next raise your rod tip about three feet, drop it back down and slowly reel in the slack which will move the bait horizontally about two feet. This will get the attention of the smallmouth and it will hit the stick bait as it sinks. If you don’t feel a strike after the bait sinks about two feet again raise your rod. You can’t work the stick bait too slowly in spring. When you feel a pick-up, wait a few seconds before setting the hook. A quick hook set will result in a missed fish. Again, the secret to success is patience. Whether you are fishing a river, reservoir or natural lake, fishing stick baits rigged wacky style is deadly for spawning smallmouth and largemouth. Just as with pre-spawn bass, having knowledge of spawning locations are essential. In clear water you will be able to sight fish and see the bass on their beds making it all the easier. When anglers can sight fish bass on a bed, they can drop the bait right in front of the bass’ nose and catch fish like a pro. Although there are times when the fishing can be tough, for the most part if you are in the right place at the right time you will have fun. Start out with a four inch stick bait and use either a #1 octopus hook or a #2 Eagle Claw Lazer Sharp L042 to hook it wacky style. Make a cast and when the bait hits the water, don’t do anything for about five seconds, but keep an eye on the line. The slightest twitch in the line or movement in any direction will signal a pick up. Line is critical for this style of fishing especially if you are old like me and don’t see as good as you used to. 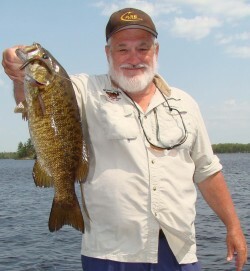 Later in summer smallmouth will hammer the wacky worm but in spring they are often just pushing the bait and if you depend on your rod to signal a strike your catch numbers won’t be very high. When you see line movement you need to be patient. Slowly reel in the slack and when you feel a tight line lower the rod tip and count to five. If the smallmouth feels any pressure at this point it can drop the bait. Next, slowly raise the rod until you feel pressure. If you feel no pressure, the smallmouth has dropped the bait. If you do feel pressure raise the rod with a slow steady motion and when the rod gets at the 11 o’clock position give it a swift pull. If you are having trouble hooking fish switch to a three inch stick bait. Don’t worry about changing colors because if the color you are using is already inviting a strike, a color change will not trigger a harder strike. However, when you downsize the bait the bass will engulf the bait as it moves it off the bed making it easier to set the hook. I prefer to use a fluorocarbon/monofilament hybrid line or fluorocarbon line when fishing the wacky worm for river smallmouth. Over the years I have been able to do considerable research with different lines due to my clients’ line choices. I have seen every kind of line imaginable in my boat and can compare the numbers of fish caught with each kind of line on a given day. While some anglers prefer braided line (and it will catch fish) I can increase my numbers with the hybrid line due both to the high visibility and limited stretch. Many of my clients inquire as to what the ideal rod is for using a wacky worm. Although there is no definite answer since much depends on the cover you are fishing and whether you are after largemouth or smallmouth bass. For smallmouth I like a six foot six or seven foot medium light action rod with a fast tip. If you are fishing cover for largemouth bass you will want to use a heavier rod. In summer, the wacky worm is a staple for me when fishing for smallmouth on the river. This is where the wacky worm has revolutionized the way I fish. Prior to the wacky worm I would fish a variety of different techniques and usually find the best presentation for the day through trial and error. In a weeks’ time I could be using several different techniques and on any given day one would out produce another. On most of my guide trips I usually start out at least one of my clients with a wacky worm while the other will throw a topwater bait or soft plastic minnow style jerkbait. On a typical day, it does not take very long for everyone in the boat to be throwing a wacky worm unless there is a good top-water bite. 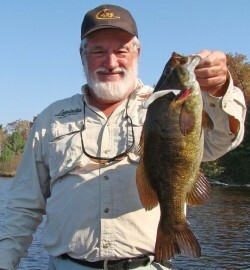 One advantage to using a wacky worm is that it will catch river smallmouth in a variety of structures while other presentations might only work around one type of structure. I like to start out in the mornings fishing grass edges and will have my client cast tight to the grass. If the smallmouth are holding in the grass then I will switch to the same stick bait but I will rig it Texas style. After we catch all of the smallmouth in the grass we usually cast wacky worms tight to shoreline cover. If smallmouth are holding tight to cover I will have my clients tie on a weedless wacky worm hook. Many times by letting the wacky worm sink it will drop into the deeper wood which will hold the big smallmouth. The only problem with rigging a stick bait wacky style is that they are a one fish bait. By hooking the worm through the center you weaken it. By the time you grab your catch all you have is the hook as the two pieces of stick bait fall into the water. In fact, the first year I was using senkos I was more concerned about saving the bait instead of getting the bass in the boat. These baits were too hard to come by to watch them fall to the bottom of the river. On more than one day we ran out of the hot color and that was almost enough to make a grown man cry. I started using the O-Wacky Tool produced by Case plastics. The tool goes over the worm and allows you to push the O ring onto the center of the worm with ease. This tool allows for the use of a slightly smaller O-ring than you can put on by hand. If the O ring is too loose it will defeat the purpose since you will need to skin hook the stick bait allowing it to break in half when you catch a fish. Minnow style jerkbaits are effective in all types of cover but shine when fished around wood cover and weeds. While soft plastic jerkbaits remain effective when smallmouth are relating to wood cover it is an essential part of my arsenal when fishing mid-river weeds. I use both floating and sinking jerkbaits when fishing river grass depending on both the current and density of the grass. If the grass is thick, I will use an unweighted jerkbait rigged on a wide gap hook and let the bait drift over the grass. Big smallmouth will hide under the grass on bright sunny days, similar to the way a big largemouth will find comfort under slop. Smallmouth will strike a surface bait, but the treble hooks will pick up grass before you even start your retrieve. My technique is simple: as you drift downstream make a cast on a 45 degree angle downstream. With a high speed retrieve reel, reel in the slack and lower your rod tip and give the bait vigorous twitches. These erratic movements will look like surfacing baitfish feeding on insects or smaller baitfish. Keep the line as taught as possible and make sure you feel the fish on the line before setting the hook. This method has resulted in many 20-inch river smallmouth in summer. Although I prefer to move the jerkbait drifting over the weeds, I have had many of my clients catch smallmouth doing nothing but just allowing the jerkbait to drift. This will work as long as you keep a taught line to set the hook. When I am guiding I will have one or both of my clients fishing over the grass with the unweighted jerkbait and I will work a weighted jerkbait like a Case Sinking Minnow or a wacky worm along the edge of the grass. This way we are able to cover the grass effectively and adapt accordingly. On a typical summer day on the river we usually use both presentations hand in hand. During the early fall, river smallmouth can scatter as they forage on minnows so you will need to cover a variety of different types of structure. Unlike in summer where minnow style baits are not as effective around rocks as a wacky worm, they will trigger vicious strikes in the fall. As the water temperature drops smallmouth start to stack up and they continue to chase schools of minnows. When fishing in current I rely on the Case Sinking Minnow and Case Sinking Shad. If the jerkbait only drops a few feet below the surface you will be missing a lot of smallmouth. Your jerkbait should drop to a minimum of half way between the bottom and the surface to trigger a big smallmouth. The Case Sinking Minnow will also catch big smallmouth holding tight to the bottom. One trick I use in fall is to rig the jerkbait on a jighead and crawl it along the bottom. Use a weedless jighead due to the possible snags. I also use a long shank on my jighead to let the jerkbait lay as horizontal to the bottom as possible.